On this page you will find information on how to record a podcast. Our golden rule is Any audio is better than no audio. so keep that in mind. Don't forget to introduce yourself in your show. Many of today's portable media players support recording audio out of the box. Search for "Voice Recorder", to see if there is an application for your smartphone. Whichever option you have close to hand, try and set the recording to the best quality format (WAV or FLAC), and set everything else to the highest setting. It's always the goal to get the best quality audio but here at Hacker Public Radio we value content over quality and so long as it's audible we'll take it. Then just record your show, request a slot, and we'll do the rest. The majority of podcasters use Audacity. First set the Project Rate to 44100Hz, then you can either record your show in Audacity itself or import the file you recorded earlier and edit it as you wish. 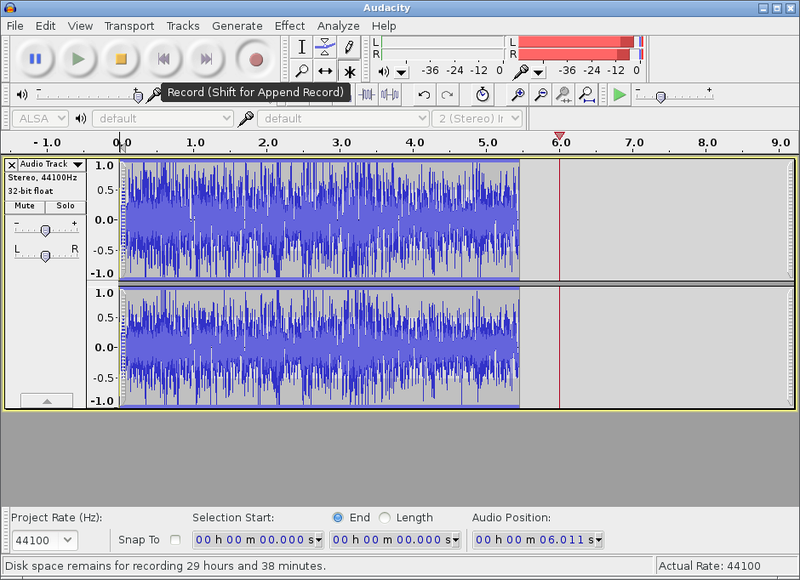 When you have finished editing your podcast you can export it. Confirm that the Project Rate is set to 44100 Hz (bottom left). File -> Export and select FLAC File. 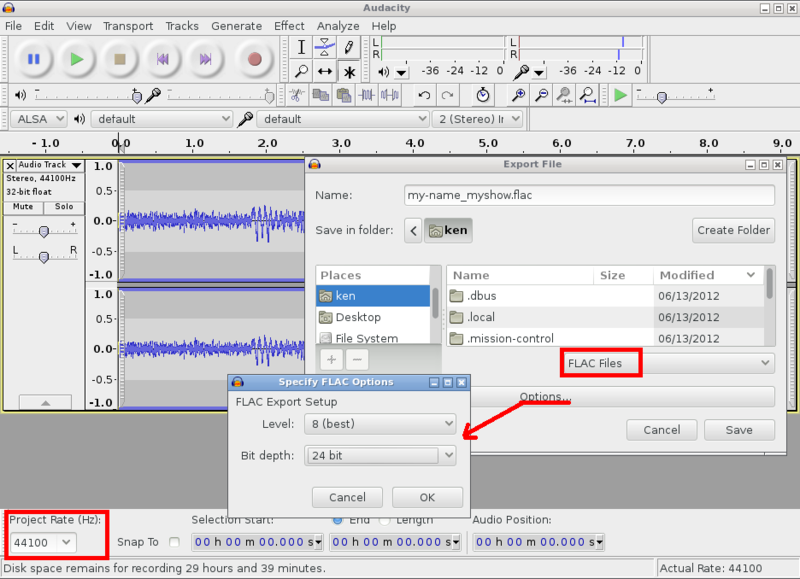 Click Options... to reveal FLAC Export Setup. Set Level to 8 (best). Set Bit depth to 24. If you want to record a one-to-one interview with someone then you can use Skype in conjunction with Skype Call Recorder. If everyone is using skype then it won't cost you anything otherwise you will need to pay for SkypeOut service. Although the quality is usually terrible, you could also put your phone on hands free and record with a portable media player. 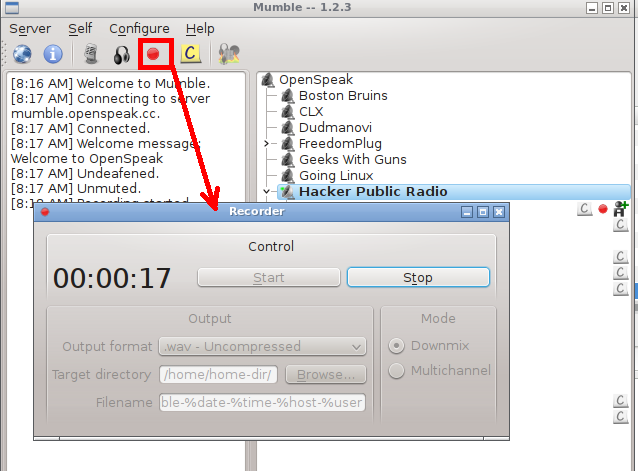 If you would like to record with multiple participants then you can use Mumble. Connect to ch1.teamspeak.cc Port: 64747 . Walk through the audio wizard and then pop into the Hacker Public Radio room. Once you are ready press the recording button, select multichannel and then start. That will record multiple tracks, one for each participant which you can edit and then submit. Kwisher made a Mumble tutorial which you might find useful and Delwin has produced a number of short shows on how to configure the audio quality. You may include backing music but it's best if you don't. Most long time podcast listeners speed up their shows, as this allows them to cram more shows into a day. Having bedding music makes it more difficult to understand, and prevents tools like truncate silence from working correctly. Others will convert shows to mono to listen in one ear leaving the other free to carry out their other chores. Still more slow the shows down so that they can improve their English. Others are hard of hearing and backing music makes it difficult to understand the text. We will by default mix down your show to one channel mono and we will transcode to MP3, ogg and spx formats. If you want to control this in more detail then please email admin at Hacker Public Radio for more information. There is no need to add any information to the file as that will be inserted based on the information you fill in when you upload the show.